Gulf Coast Village, the premiere Continuing Care Retirement Community in Cape Coral, is celebrating its 30th anniversary by better positioning itself for future growth. 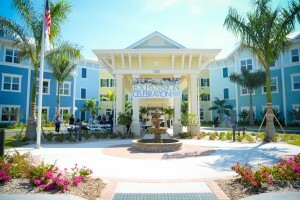 In operation since 1989 as a not-for-profit organization, Gulf Coast Village is the only CCRC (Continuing Care Retirement Community) in Cape Coral that offers the full continuum of care, which includes assisted living, skilled nursing, secured memory support, home health and rehabilitation services. With a host of resort-style services and amenities that make the most of the coastal setting, residents enjoy maintenance-free living, chef-prepared dining, and a daily schedule of activities and events. In addition to the array of senior living options and amenities, Gulf Coast Village provides a variety of short- and long-term healthcare services on one campus. A leader in senior living communities for more than 120 years throughout the U.S., as well as 30 years at Gulf Coast Village in Cape Coral, Volunteers of America has projects underway in Fort Myers and Estero. The Preserve, a three-story, 118,000-square-foot community with 21 assisted living apartments, 17 memory support suites and 75 skilled nursing suites for senior residents needing specialized or advanced health care, is expected to open in June in Fort Myers. Volunteers of America is also planning to build the 295-unit Colonnade of Estero for continuing care on 22 acres. Gulf Coast Village is also the only provider in Florida that offers Senior Choice at Home, a Continuing Care Retirement Community that is a program of coordinated long-term care services for seniors who prefer to stay in their homes as they age. If members need assisted living, skilled nursing or memory care in the future, living arrangements are secured as part of their membership. Founded 30 years ago, Gulf Coast Village is the premier Continuing Care Retirement Community (CCRC) in Cape Coral, Florida. Residents enjoy active living in an unparalleled lifestyle of comfort and convenience with a rich array of services and amenities that are focused on living well. The community also offers the security of knowing there is the full continuum of care when needed including: assisted living, skilled nursing, secured memory support, home health and outpatient services. Gulf Coast Village is located at 1333 Santa Barbara Blvd., Cape Coral, FL 33991. For more information call 239-772-1333 or visit www.GulfCoastVillage.com. Gulf Coast Village is sponsored by Volunteers of America, a national nonprofit faith-based organization dedicated to helping those in need rebuild their lives and reach their full potential. Volunteers of America was founded in 1896 and is one of the nation’s largest nonprofit providers of quality, affordable housing for seniors and a provider of professional long-term care including assisted living, home health care and nursing home care.